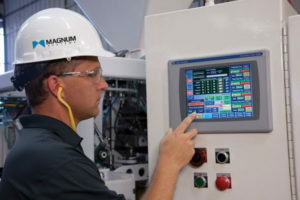 At Magnum Systems, our responsibility is to integrate rapidly evolving instrumentation and process controls with established principles and years of industrial automation experience. We’ve manufactured premier bulk material handling equipment and packaging machines that last for decades. The need to incorporate the latest industrial control technologies into our process equipment and packaging solutions keeps our systems competitive and state-of-the-art. We design, engineer and manufacture control systems using key components from the most recognized names in the industrial control and automation industry in the United States and globally. Magnum Systems has decades of bulk material handling and processing experience that complements our process logic for complex process systems. We know how to add the “brains” to your process and packaging systems. Big or Small, New or Migrating, Complex to Simple… We’ve Got This. 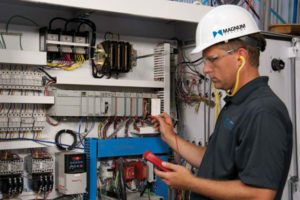 From designing a brand new control system or migrating a legacy control system for an existing process or packaging system, our industrial automated control systems can be customized for small systems requiring a few I/O and motors to complex systems with high I/O counts and numerous motors. Our systems and controls can range from railcar or truck unloading, to in-plant transfer systems, batching and blending, to packaging line operations such as bag filling, sealing and robotic palletizing.